Event organizer Muna Mohamed (right) talked with Vivianna Alvarez, a first-generation college graduate. MEDFORD — Samuel Joseph said he’d never forget the day he Googled “Canada Goose jacket” and discovered that the parkas he saw so often on the Tufts University campus cost $900. The classroom of fellow first-generation college students broke into laughter. In the safe space of the fifth annual First Generation College Student Summit on Saturday, they acknowledged that such shock is an uncomfortably common feeling. 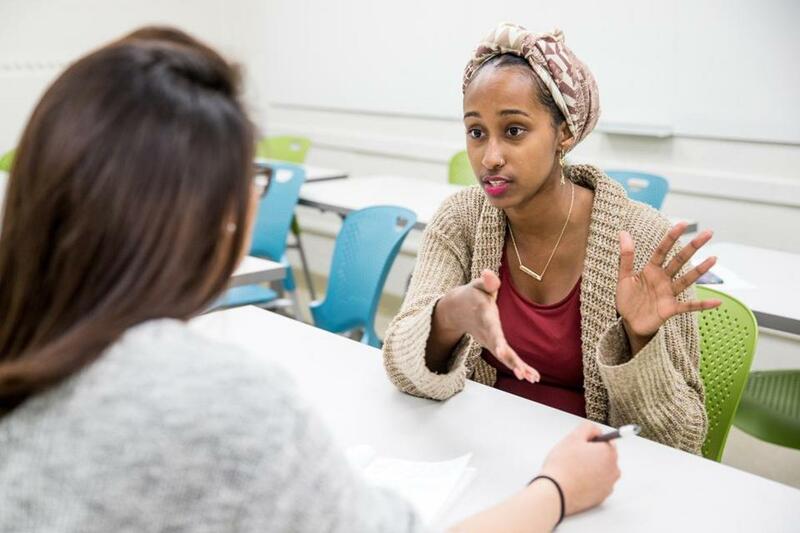 “Class is an elephant in the room — but it’s only an elephant in the room to the students who don’t come from upper classes,” said Muna Mohamed, a Tufts sophomore who organized the student-led conference. The conference, hosted this year at Tufts, brought together more than 200 first-generation college students from across the nation. Participating schools included the Massachusetts Institute of Technology, Middlesex Community College, Virginia’s George Mason University, the University of Chicago, and the University of Michigan. It was organized in conjunction with Class Action, a national nonprofit dedicated to ending classism. “If I had my way, people would put being first-gen on their résumé, because it’s so indicative of your character,” said Gregory Chin, a junior at Tufts who led a workshop on networking. Chin dropped out of school in sixth grade to start working to help provide for his family. While so many college students “come out of the womb with a network,” Chin said, he had no idea what “networking” was. Students asked questions and pooled advice, ranging from following up after meeting someone to dealing with race- and class-related microaggressions while networking. The theme of this year’s conference is “Unpacking Intersections: Navigating Power, Privilege, and Pride” — conversations that students from higher socio-economic brackets need to have as well, said Mohamed. As a black Muslim woman from a low-income background who grew up in a Somali immigrant community, Mohamed is faced every day with the intersectionality of her own identity. But the onus should not solely be on her to bridge the chasms between herself and fellow students, she said. “Why don’t you navigate your power, your privilege, and your pride?” she asked. Mohamed and other students spoke of how the term “being broke” is used casually around college campuses, even glorified — something that stings for many of them to whom “being broke” means more than not being able to order takeout twice a week. Over and over, students spoke in workshops about little and big moments that reminded them of their socio-economic status. One young woman recalled how she had to drop a painting class because she couldn’t afford the extra hundred dollars for supplies. Another spoke of feeling “so ashamed” on the first day of a computer science course, when other students who had shiny MacBook Pros gawked at her clunky, 7-pound, early-2000s laptop. Haleigh Copley-Cunningham remembered how her roommate was excited to go on a biology research trip over spring break. But Copley-Cunningham, who takes six classes a semester while working two jobs and sending money home to her family in Ohio, said such a trip was not possible for her. The Tufts sophomore had to work 14 hours a day over her spring break. Some students had returned to school as adults and had the added responsibility of supporting children. Kelly Kennedy, a 49-year-old junior at Rutgers University-Camden, spoke of the struggle to put herself through college at the same time as her 22-year-old daughter, while supporting her 14-year-old autistic son. And even in seemingly progressive environments, students encountered insensitivity to their struggles. During a workshop on classism led by MIT’s Lisa Lozano and René Andrés García Franceschini, the senior and sophomore told students about encountering professors who confused class and race, and class and being first-gen.
And while many of the challenges are financial, others involve navigating the complex college scene, including “the inherited knowledge is everything that is available to you,” said García Franceschini. But there are resources available to combat many of the challenges — if you ask, said students and staff. Robert Mack, an associate dean for student success and advising at Tufts and a first-generation student himself, said the university is committed to continuing to expand support. “Seeking help is the key to success in college,” said Ines Simbi, a 19-year-old freshman at Bennington College in Vermont. She felt so alone on campus at first, she said, half a world away from where she grew up in Rwanda. She was concerned about finances, and insecure about her English, although she is now fluent. “I kept saying that I wanted to pack my bags and go,” she said. But after friends encouraged her to ask the college for help, she met Selina Petschek, a 24-year-old adviser to international and first-generation students at Bennington — and that mentorship made all the difference, she said. Petschek attended the Saturday conference with her. Simbi said she never used to view her first-generation student status as a positive, but that has changed.